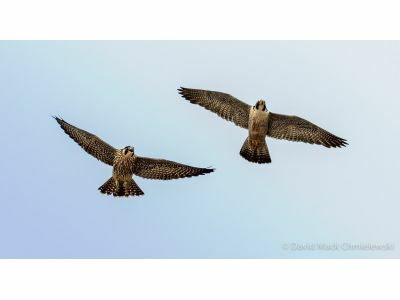 Our young falcons do have names. Many great names were suggested through the website and the top suggestions were chosen. In addition to submissions through the website, a group of 6th grade students at Parchment Middle School worked together to brainstorm names for our falcon chicks. They have been watching the nest cam, with their science teacher. The students wanted to focus on names that were specific or meaningful to Kalamazoo or our great state of Michigan and two of the names they suggested were chosen. It was very sad however to report that the young male falcon that died was named Jeter, a choice by a number of folks, including the Parchment 6th graders. Of course, the name was a reference to Derek Jeter, Kalamazoo’s famous baseball star. It was heartbreaking to tell them about the accident, but the students felt it was important that the young bird had a name. After that distressing event, I did not want to announce names until the birds seemed like they were off to a better start. So, even though we have one late bloomer that we are still waiting to fly, the female falcons are Iris (Black 28 / Blue Z), Merze (Black 27 / Blue Z) and Zoe (Black 29 / Blue Z). Iris was a name suggested by the Parchment 6th graders in reference to the state wildflower of Michigan, the dwarf lake iris. Iris, the Peregrine falcon, sports a strong blonde eyebrow and cheek patch in her juvenile marking, which resemble the yellow band in the sepals of the blue iris flower. Merze pays honor to Merze Tate (1905-1996), the first African American to earn degrees from Western State Normal School (now Western Michigan University) and Oxford University in England, as well as degrees from Harvard and Columbia Universities. She was a world traveler and international correspondent, and her scholarly work was used by the Department of State. She also founded the Merze Tate Travel Club and provided opportunities for young African American girls to travel domestically and internationally in the 1930’s. Zoe means “life” in Greek. Zoe may be confused however about what life is like for a Peregrine falcon. She has apparently not read the Peregrine handbook that describes the amazing flying ability of Peregrine falcons and that they fledge between 40 and 45 days of age (This is Day 48). We wonder if she thinks she is a Penguin, rather than a Peregrine as she has not yet taken to the sky. She does have a great appetite and today showed some interest in the flight training her sisters were engaged in. She did some wing flapping and was even joined by Iris who demonstrate her flapping technique. But, then she settled down for another nap.